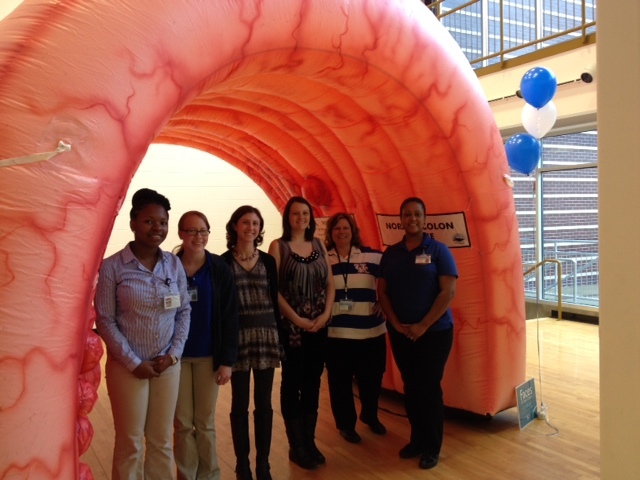 Jailyn Stevenson , Lindsay Adamson, Melissa Smith, Tara Mason, Carol Hisle and Jessica Jackson stand in front of the inflatable colon at Thursday night’s Colon Cancer Prevention Fair held at the Lyric Theater. The event was held with Kentucky CancerLink and Kentucky Cancer Program. The evening featured health information about colon cancer designed to raise awareness and encourage screening for early detection. A total of 12 free, at-home test kits were given out to at-risk visitors to the event. The LFCHD TB team, from left to right: Dr. Malkanthie McCormick, Yvonne Beatty, Katie Myatt, Jessica Cobb, Sandy Breeding, Trenna Vandergrift, Dr. Rice Leach, Brittany Dominick, Cristina Hiten, Sara Zagaruyka and Laura Collins. God’s Pantry Food Bank invited members of the Lexington-Fayette County Health Department to tour the main facility Monday afternoon as part of an effort to find ways to cross-promote each agency’s services. 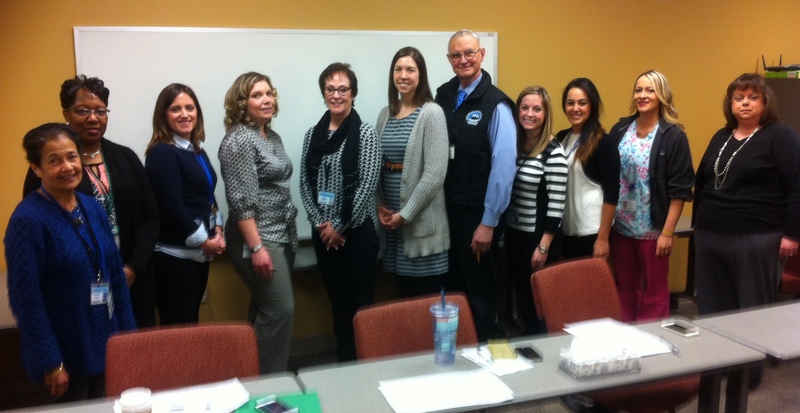 CEO Marian Guinn and External Relations Director Rebecca Price met with Dr. Rice Leach, Jeanette Hart, Melissa Smith, Lois Davis, Kevin Hall and Liz Pfeffer. God’s Pantry serves 50 counties in central and eastern Kentucky and distributes more than 2 million pounds of food each month. Of their clients, 43 percent of the households report at least one member with diabetes and 70 percent with high blood pressure. LFCHD staff joined community organizations throughout Lexington and the region Thursday morning for a special breakfast spotlighting colon cancer awareness. Hosted by Colon Cancer Prevention Project at the Lyric Theater, the event was a call to action for groups to unite in spreading information about colon cancer. Mayor Jim Gray kicked things off with a proclamation declaring March Colon Cancer Awareness Month in Lexington. Cancer survivors spoke to the crowd, and agencies had the chance to exchange information for future collaborations. 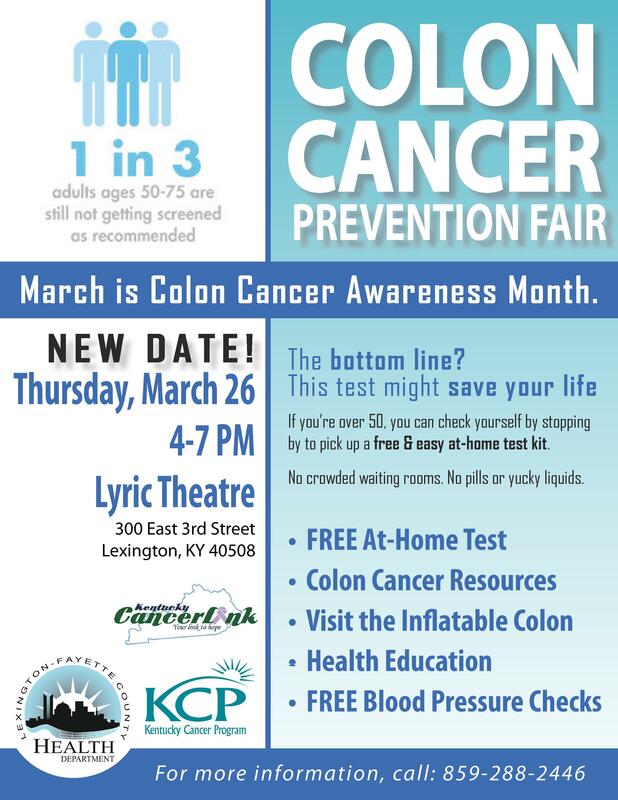 The health department and Kentucky CancerLink will return to the Lyric 4-7 p.m. March 26 for a special colon cancer awareness event. The two agencies have been partnering on a project to provide at-risk patients with free, at-home test kits. Almost 500 have been given out to date. 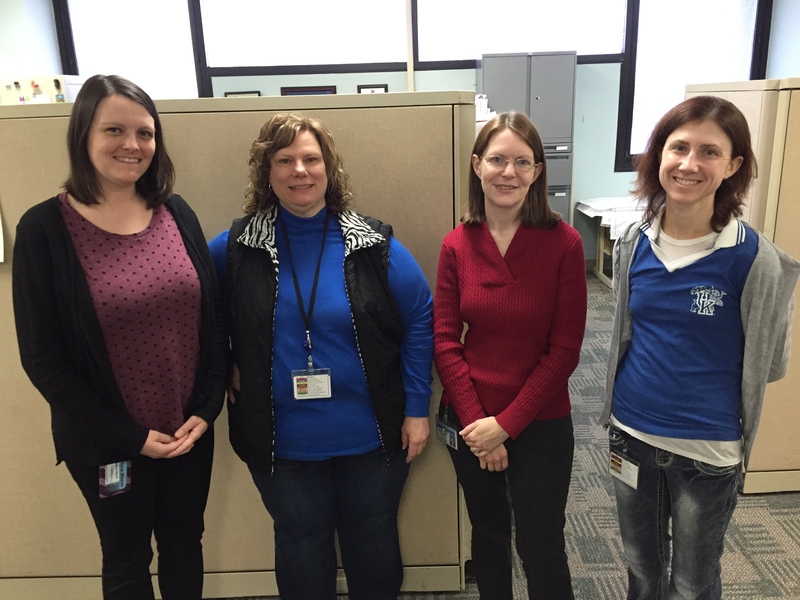 National Dress in Blue Day was held Friday, March 6, but because of LFCHD’s closing due to snow, our staff wore blue March 13 to raise awareness for colon cancer. Thanks to all who took part! Note: click on a picture to see a larger image. March 16-20 is Environmental Health Professionals Week in honor of the numerous registered sanitarians working across the state to ensure the health, safety and welfare of their fellow Kentuckians. We are very excited to recognize the contributions made by our environmental health professionals to public health and to the people of Lexington. The Public Health Environmental Health Team: Ben White, Laura Sandusky, Skip Castleman, Joy Spencer, Jaime Lundblad, Luke Mathis, Danielle Wells, Pam Hopkins, Amy Sullivan, Jessica Cobb, Matthew Yarnall, Barrett Schoeck, Russell Cantrell, Nathan Powell, Kara Stanfield and Ralph McCracken. Not pictured: Christopher Washington and Kevin Gabhart. The first Registered Dietitian Day was celebrated in 2008. Wednesday, March 11 has been designated Registered Dietitian Nutritionist Day in 2015.